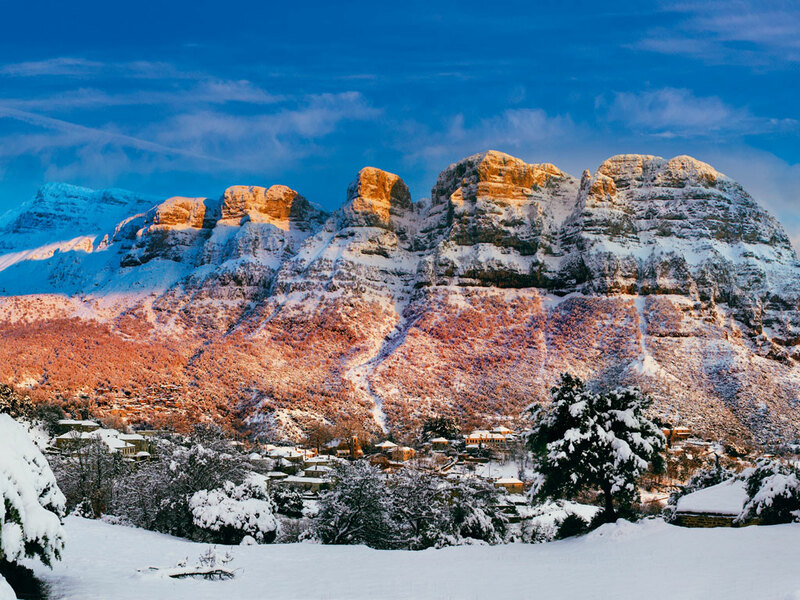 If you're an adrenaline enthusiast, South Africa, with its array of adventure sports, is the place to be—never mind your age! Treading along the wire mesh bridge towards the bungee jump platform, I keep my strides firm and steady even though my heart is beating like a drum. My thoughts race back to 2007 when my daughter Tarini had blithely jumped off South Africa’s Bloukrans Bridge and I had chickened out despite a ‘50% Dad Discount.’ Eleven years later, I am back to dive off the same 709-foot bridge, an architectural marvel in touristy Garden Route, a 200-kilometre haven dotted with dense forests, pristine beaches and hulking mountain ranges. That this is the world’s highest bridge bungee becomes doubly evident when I look down: a thickly forested valley drops down sharply to the Bloukrans River; its surface shimmering like a deadly black snake. With my pulse racing, I approach the registration desk where my eyes dart in the direction of a large sign in red-and-white lettering. ‘Fear is Temporary, Regret is Permanent,’ it reads. But this time there isn’t—and cannot be—any room for regrets. This time, at 60, I am determined to take the leap. As my photographer friend Sundeep and I step into the small airfield at Plettenberg Bay, a seaside town in Garden Route, we are thrilled to notice a spotless blue sky—a perfect day to dive. My instructor Mike is a lanky young man, and his demeanour is as calm and reassuring as that of a cowboy in a Western. That he has 15,000 jumps under his belt somewhat puts me at ease. On the airfield, Mike straps me into a full-body harness, checks the contact points and gives a quick briefing before we clamber into the trusty old Cessna. When we take off, the airfield starts to shrink in size. We gradually and smoothly climb to altitude, heading out to the Indian Ocean before looping back towards land. It is the most spectacular day. Far below I can see the sparkle of the giant breakers as they charge towards the sandy shores with mighty green mountains rising inland. Mike calmly repeats the instructions one more time into my ear, connects me to his harness and hands me my goggles. Anxious, I find myself humming the chorus from America’s “Sandman” under my breath. But before I can complete the lyrics the door opens and a gush of air and noise fills the cabin. Mike swiftly manoeuvres us towards the exit. First to jump off is Sundeep and his man, Jeff. With no time to think (a good thing considering the task ahead), I place my feet on the door’s edge, cross my arms and arch my body. And then with a great heave, I take the leap, tumbling and falling as the sea, sky and land spin around me like a 3D movie. 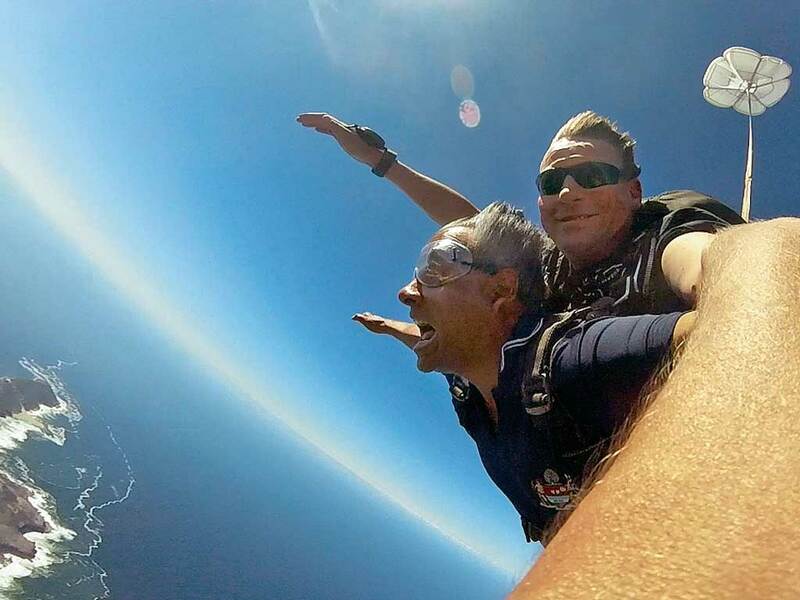 Plummeting down 10,000 feet, I am screaming at the top of my lungs when Mike taps me on the shoulder, a message to spread my arms; and then, like an eagle, I continue to dive freely, swooping down at 200 feet per second. The goggles are plastered to my face and the howling of the wind in my ears is overwhelming. Thirty five seconds later we have already halved the distance. That’s when Mike pulls the ripcord, and I am instantly consumed by an enormous feeling of weightlessness as the parachute opens in a bright splash of colour above us. I am giddy with delight and the feeling of riding the sky is just as the Sandman promised, like an “eagle in the eye of a hurricane that’s abandoned…” We continue to descend in circles, like two giant butterflies. Mike hands me the controls and I pull the parachute ropes down and around in an attempt to bank, but the power of the air filling the canopy takes me by surprise. With the airfield looming larger by the second, Mike takes over. Asking me to stretch my feet, he guides me down to a perfect landing on the soft wind-blown grass. I feel awesome, on top of the world, like someone who has conquered all before him. Between the sky dive and the bungee, Sundeep and I also try our hands at kayaking and lilos. The seascape by the Storms River Mouth at the end of Garden Route is one of the most spellbinding you will ever see. The ocean drives against the land in a series of violent waves that crash and foam relentlessly against the stark black rocks guarding the coastline. In practical terms, what this means is that we have to abandon the sea approach and instead lug our paddles along a short hike through a lush carpet of evergreen forest and fynbos. This takes us to the put-in point tucked away inside the river mouth. We clamber aboard the red inflatable kayaks, two per boat, and slice swiftly upstream through the dark waters. This calm surface is a cakewalk compared to the big white-water adventures I have done. But I am enjoying the feeling of penetrating deep into a river canyon, like my earlier rafting trip along China’s Yangtze river, Asia’s longest. As our little flotilla of kayaks paddles upstream, we come across a huge cave with a vaulted ceiling off which reflect the sun-dappled waters, and a wooden stepladder that leads further into its forbidding black depths. Our guide Norman tells us that the cave is home to an army of bats which flies hundreds of kilometres up and down the coast in search of food. Further up the river, where the ocean surge meets the fresh water stream, we switch to red lilo mattresses and paddle upstream on our stomachs as the water gets shallower and the gorge narrower. Soon we hit the end point. It is time to reverse course. More than the adrenaline rush, I’d say that this peaceful white-water trip makes for a pleasant and scenic excursion into a remote gorge. Before kick-starting our adventures in Cape Town, we plunge into the Mother City’s gastronomic goodness, trying eveything from authentic African cuisine at Gold Restaurant to Malay fare rustled up in Cape’s Malay quarter of Bo-Kaap. As for the adventure, it begins the next day with stepping off Table Mountain. Literally. We go up the easy way with the rest of the tourist hordes in a cable car but decide to abseil down a 370-foot stretch of sheer rock face. My instructor Chizzy repeatedly asks me to take a step back as I stand frozen at the edge of the face with my feet about to slip into nothingness. Far below is the urban sprawl of Cape Town’s glitzy skyscrapers, long avenues and crowded docks, and further away lie the sparkling waters of Camps Bay. I take a deep breath, lean back and trust the rope. As I start to slide down the uneven pitted surface, I lose sight of Chizzy. Sundeep is coming down to the left but really we are entirely on our own, quelling our fears as we struggle down the face of the mountain. Instead of panicking, I begin to practise my jumps and quickly gain confidence. But the surface is uneven and my inexperience causes me to lose my footing on landing. In an instant, my feet slide out and bunch up under me and my body thuds sideways against the rock with the rope cutting painfully into my neck. Suspended hundreds of feet up in the air and beginning to oscillate, I desperately hang on to the rope, fighting the dread rising in my throat. Luckily, I regain both my composure and my footing and continue. Sundeep is still far above and wants me to slow down to capture the action on his GoPro. But there is no chance of that as I am pulled inexorably down by exhaustion and gravity. All of a sudden another unpleasant shock springs up—the rock wall disappears from under a 200-foot overhang and my feet flail to find grip. I look helplessly down into the abyss; there is no choice but to lower myself, hand-over-hand, slowly down the rope. After what seems an eternity, the second instructor appears below me, standing on a ledge, and it’s in his arms that I fall gratefully. Released from the harness, I stand on unsteady legs, trembling with adrenalin and relief. This one, I conclude, has been quite the baptism of fire. The next morning we pack our bags for Hermanus, a picturesque coastal town 120 kilometres from Cape Town, where more land adventures await us. First amongst them is zip lining. My first brush with this fun activity was in Orlando. Here, in Hermanus, an old tractor-trailer drags us to the topmost line in the hills above and we sail down them cutting through a thicket of oak, poplar and ivy, accompanied by two cheerful guides Colin and Tsipho who clip us on and off at every stage. Still, it is not a patch on the much higher and longer lines that I did entirely on my own in Florida—I compare the feeling to being spoon-fed in a nursery as opposed to the rough-and-tumble of making it yourself in high school. Later on, chatting with Clinton, the affable owner of SA Foreign Adventures, I discover that the adventure outfit has much higher and longer lines in operation at Cape Town. The Hermanus lines are Clinton’s pioneer venture and not all have proper landing platforms. So my recommendation would be to give it a shot in Cape Town for a more fulfilling experience. The next activity, quad biking, through the forests bordering Hermanus, seems great fun and I am confident that the gleaming bikes with their four big tyres won’t be difficult to handle. How wrong I am is something I learn quickly when I find myself struggling with the controls of a single-seater Kymco 300 trying to keep it on an even keel on the rough dirt tracks. Discretion wins over valour and I switch to the larger two-man Polaris 500 with my guide Dumisani now riding pillion behind me. We set off bumping along the rough trail that snakes through the thick forest. Gradually, I gain confidence and control over my sturdy no-gears steed. Soon we emerge into open space and are now racing through a lush vineyard owned by famous winemaker Hamilton Russell. With the sun shining brightly down on my back and the wind in my face, I feel like Peter Fonda in Easy Rider. 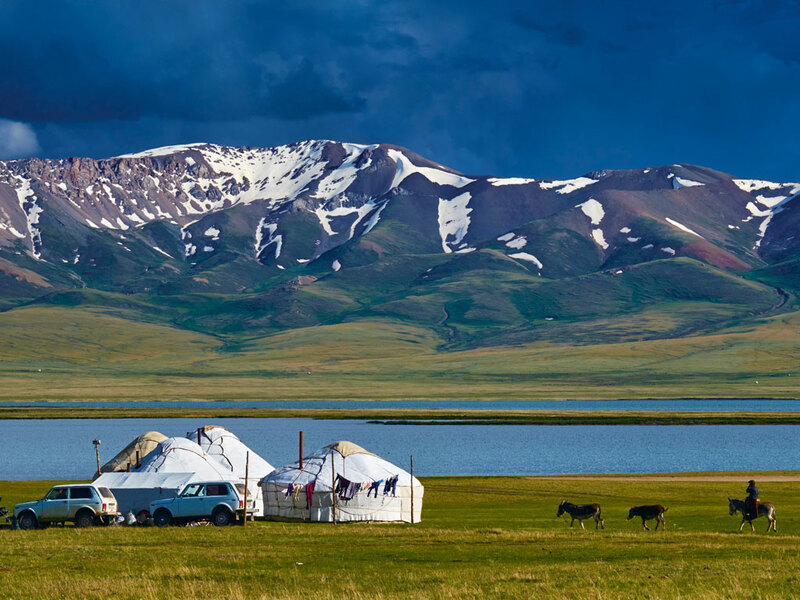 Upon reaching the crest of a hill, I am awestruck by the magnificent panorama before us. 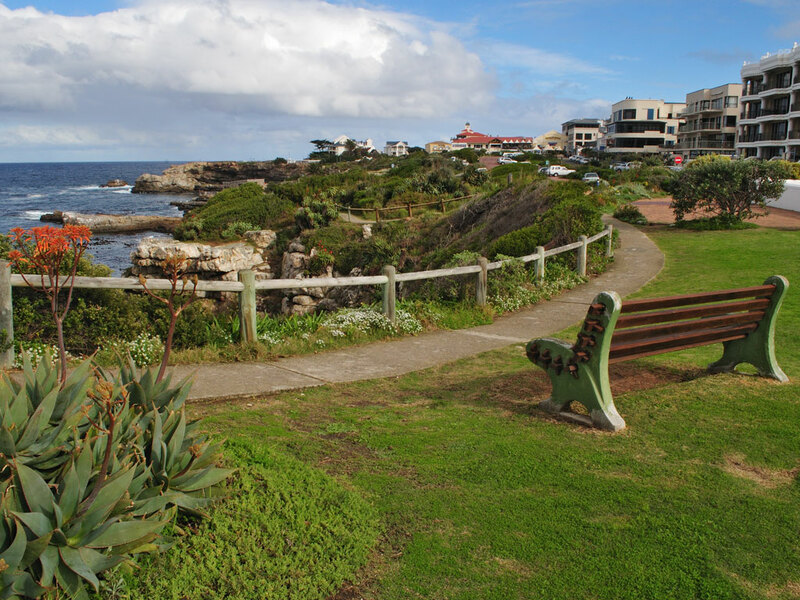 Hermanus is sprawled to the right, sparkling in the sun on one end of the vast stretch of Walker Bay, whereas Gansbaai, a small town ideal for whale watching, is perched on the other end of the horizon. 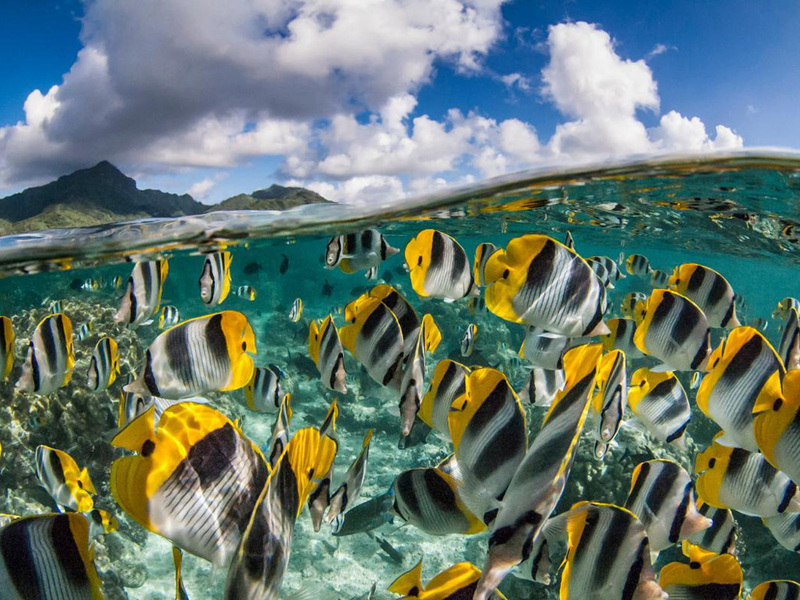 It is the bluest ocean imaginable marked by white lines of breakers surging towards miles of sandy beach, appearing and disappearing like laugh lines on the sparkling face of Neptune himself. Sundeep and I stand in silence to take it all in—it is one of those rare moments when one is overwhelmed by the beauty and wonder of creation. After the high-adrenaline adventures in Hermanus and the Garden Route, the toboggan run, on the Long Tom Pass in Panorama Route in Mpumalanga province, pales in comparison. 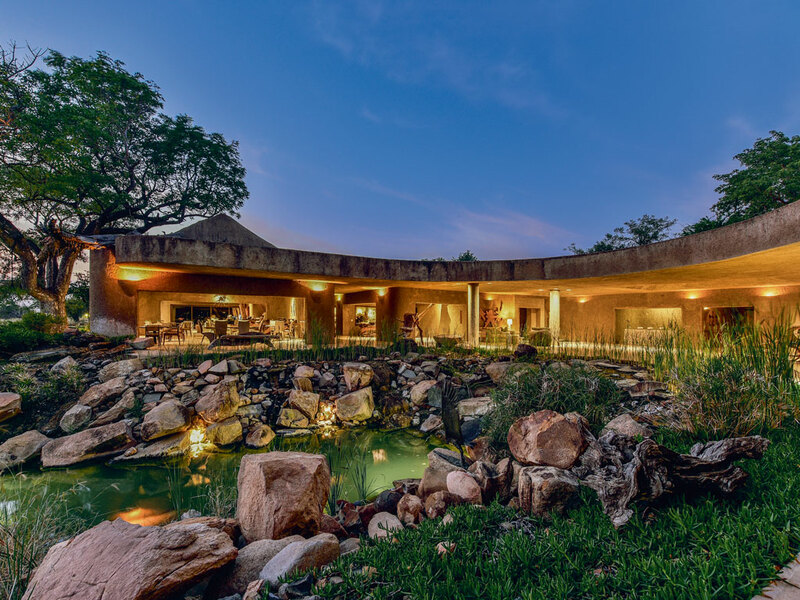 The Panorama Route is a superb self-drive which explores the northeastern section of the Great Escarpment of the Drakensberg, traversing spectacular views of canyons and waterfalls. 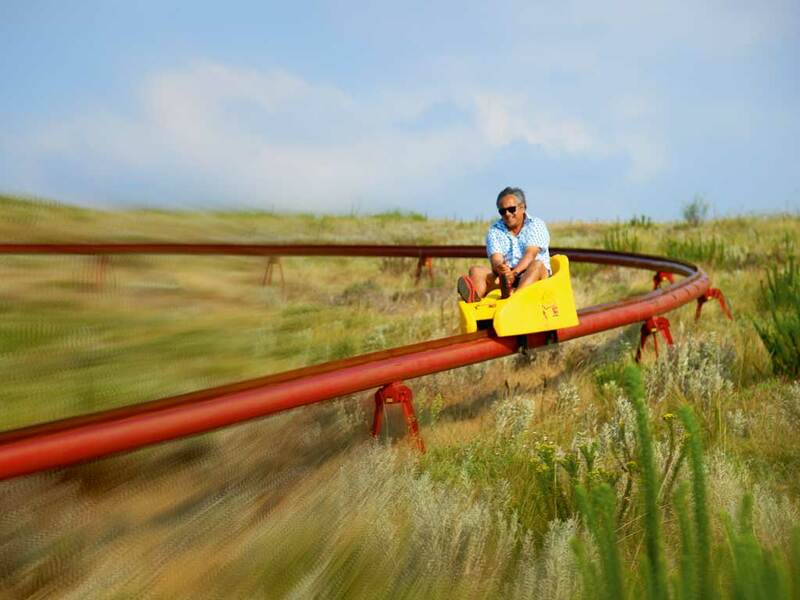 In snowless, sub-tropical Africa, tobogganing however takes the form of riding a yellow cart on a single red monorail down a hillside with only gravity as your accelerator. It is certainly a giddy feeling as I hurtle down the 1.7-kilometre track at 45 kmph but I am quite blasé about it, having been spoilt by all the extreme stuff I have done in the past week. My overconfidence, however, manifests itself in applying the brake too late and I end up overshooting the alighting platform which ends with an undignified exit from the cart. Back at Bloukrans, I am the day’s last jumper. Everything seems to be falling into place—it feels like my whole life has come full circle to this moment, this unfinished business. I chat with a reassuring young German woman and her father who bungeed minutes before. The interaction offers some solace. I step into a full-body harness. The crew straps my ankles firmly into bright red padding, carrying me like a baby to the edge, distracting me with meaningless chatter all the time. I take a moment, bend my knees, look out unseeingly at the horizon, and then, I am over and off and falling and falling. I scream as the air rushes past me. When I reach the end of the tether, my body snaps back in a giant arc before I start to fall again. Up and down, I bounce in smaller and smaller oscillations, hanging like a rag doll. I grin foolishly at the inviting carpet of green below me. I am ecstatic, happy beyond measure, free at last. 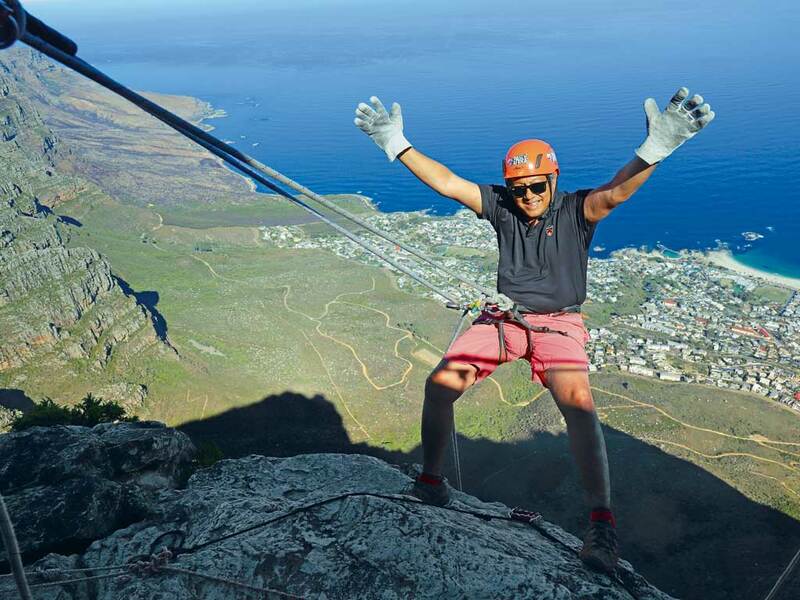 If you want to come down Table Mountain the hard way, there is no better option than abseiling (www.abseilafrica.co.za; R1100/Rs5,900). 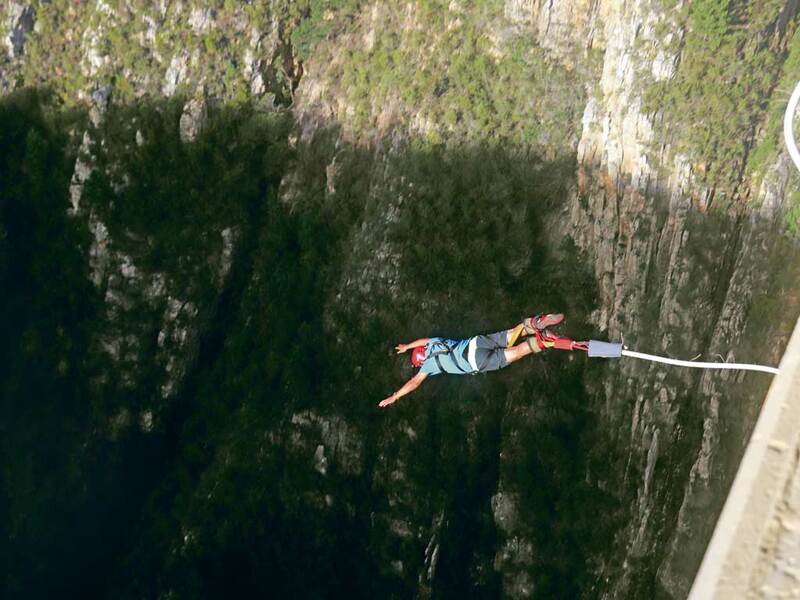 For the world’s highest bridge bungee experience—525 feet in less than five seconds—head to Bloukrans Bridge in Tsitsikamma , Garden Route (www.faceadrenalin.com; R1000/Rs5,400). South Africa is also great for skydiving, and it is cheaper to skydive here than Dubai or Europe. Skydive Plett in Plettenberg Bay claims to have the world’s most scenic drop zone (www.skydiveplett.com; R2600/Rs14,000). For fun water activities, the Storms River Mouth is your best bet. 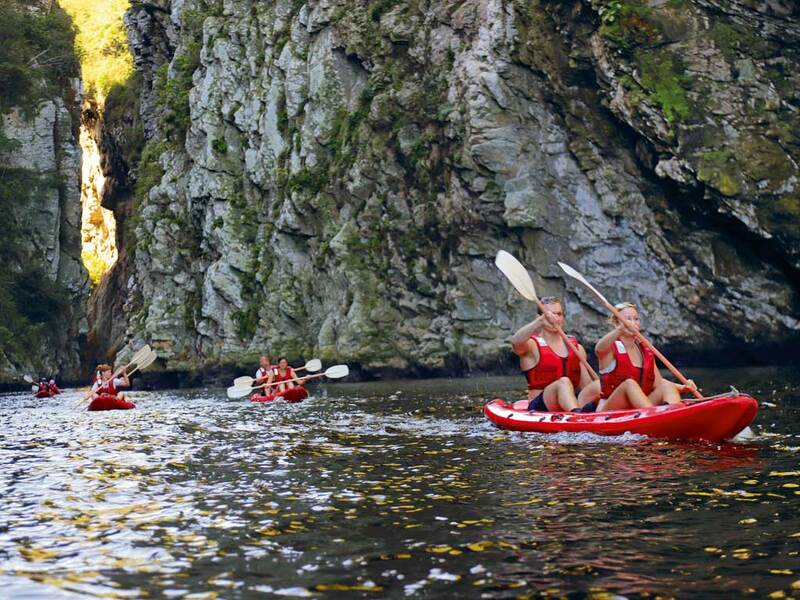 You get to paddle upstream in a kayak before switching to a lilo to explore the narrower recesses of the beautiful gorge (www.untouchedadventures.com; R550/Rs3,000). 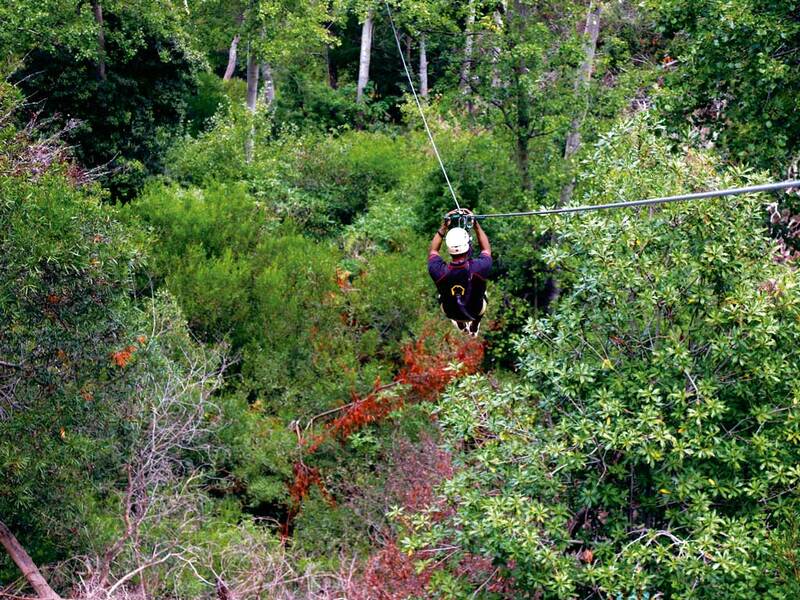 The forests behind Hermanus offer zip lining, and quad biking over dirt trails and through lush vineyards (www.saforestadventures.com; R450/Rs2,400 for zip line; R500/Rs2,700 for quad bikes). For a thrilling three-minute toboggan-rail ride, the set up at the start of the scenic Panorama Route in Mpumalanga province is quite good (www.longtomtoboggan.co.za; R250/Rs1,300). 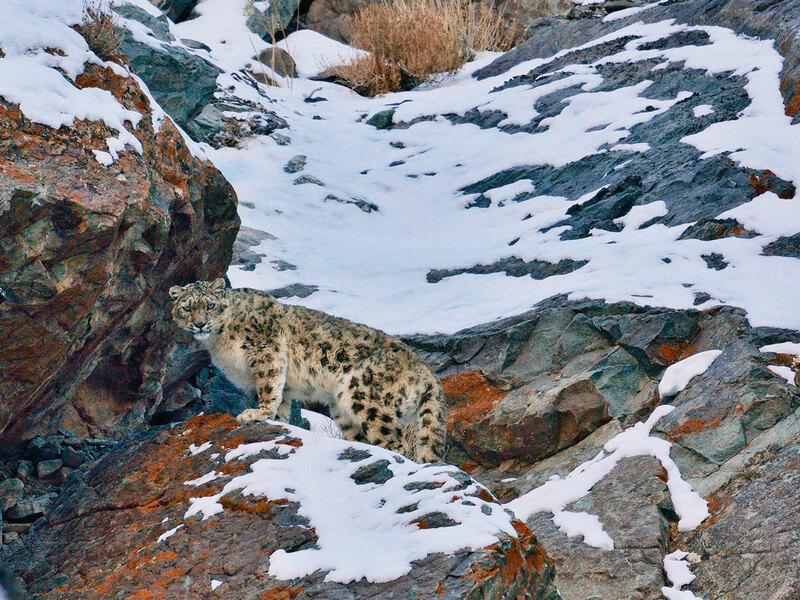 Ranjan Pal pursues his twin passions for travel writing and the outdoors, at the age of 60. 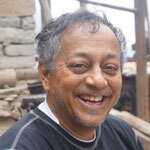 Equally excited by a Himalayan trek and a raging rapid, he believes that travel is life-changing.